Donghwa Entec’s Fresh Water Generator is used to desalinate seawater for ships. There are two types of fresh water generator − the R/ O type and the Low-pressure vapor type. The Low-pressure vapor type is most widely used in commercial ships because it utilizes wasted engine jacket water or steam while sailing. 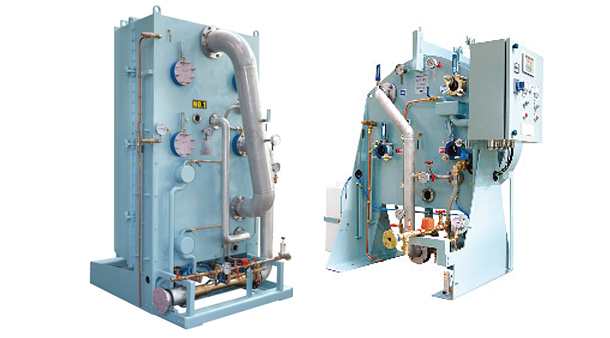 The engine jacket water and steam can be utilized as a heat-source, and Shell & Tube type and Plate type are available. The seawater is heated by various heat-sources under the vacuum state, and then vaporized accordingly. The vaporized seawater is desalinated in separate filtering unit before being condensed, and then fresh water is produced. Meanwhile, the salinity of produced fresh water shall remain at 0~10 ppm. The Fresh Water Generator is comprised of a vaporizer, condenser, demister, salinometer, distillate pump, ejector and steam injector. The Multi-stage Fresh Water Generator can achieve high efficiency when a large amount of fresh water is required with a small amount of calories due to lack of heat-source. This can be classified into MSF and MED type. Multi-stage Fresh Water Generator is manufactured under the license of CRC, United Kingdom. The excellent service of DongHwa Entec makes it possible for the end-user use its products for a long period of time. Consequently, global market competitiveness was achieved, and the company supplies its products to the top-6 shipbuilders and top-3 engine manufacturers, small-and-medium ship-yards and shipping liners in the Korean market.